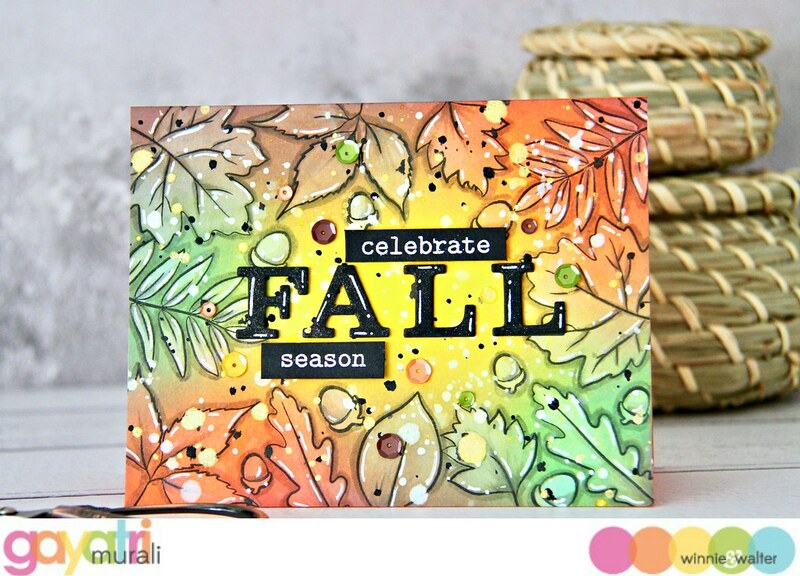 I have a fall card to share with you today. 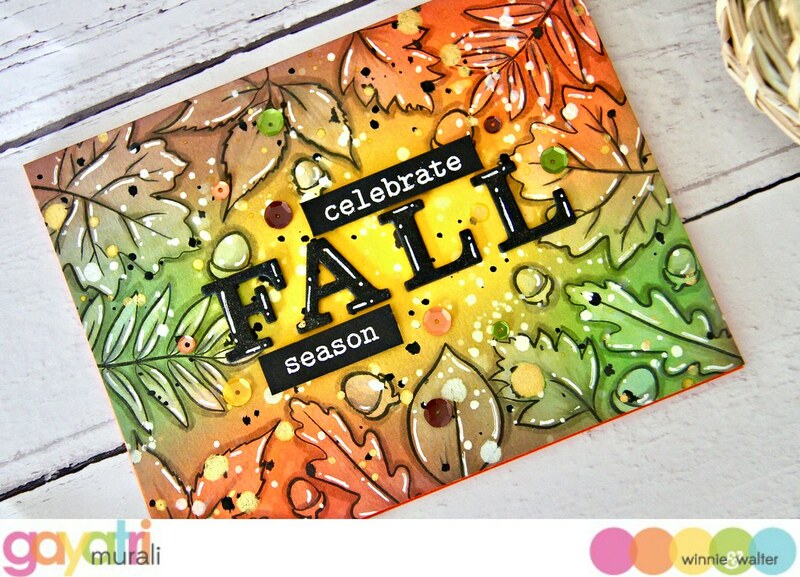 I love this card for its gorgeous rich fall colours. Here is the card. I started with sponging distress oxide inks in Aged Mahogany, Ripe Persimmon, Gathered Twigs, Fossilized Amber and Mowed Lawn on a white panel. I sponged the Fossilized Amber in the centre and the rest of the colours randomly around it. Then I stamped the leaves from In Bloom Renee’s Leaves stamp set on the edges of the panel using black ink. I used Simon’s intense black ink as it is good with watercolouring. I also stamped a few nut images to fill in gaps. I kept the centre of the panel clear of any stamping. I will used it for the sentiment. Then using a brush and clean water, I coloured the stamped leaves and nuts with water. The property of distress oxide inks are they go chalky with water. The colours fade to a whitish chalky finish. This makes the images significantly lighter than the background. I love the effect. To make the leaves and nuts pop, I added drop shadow using comic cool grey markers C3 and C1. Using the white gelly roll pen, I added highlights to the images. Then I spattered some white, gold and black paint spatters all over the panel. I left the panel to dry while I worked on my sentiment. 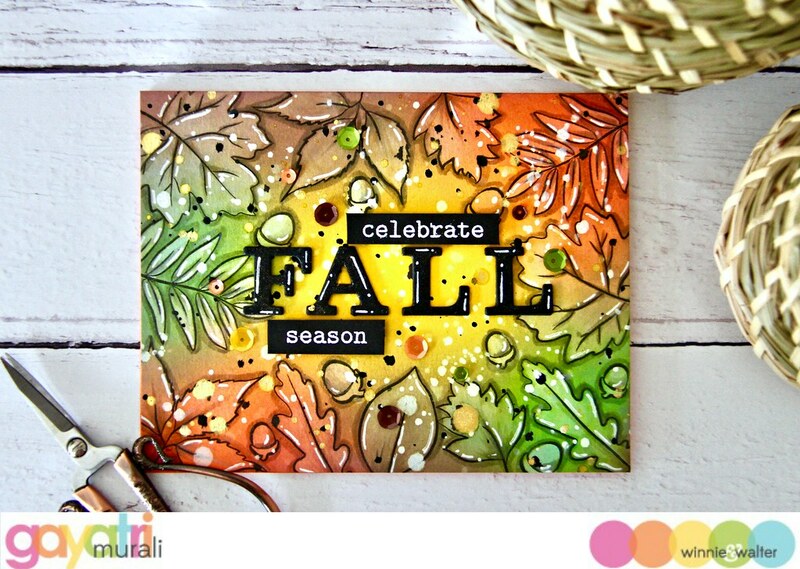 The sentiment is made up of both die cuts as well as white heat embossed stamped sentiment. 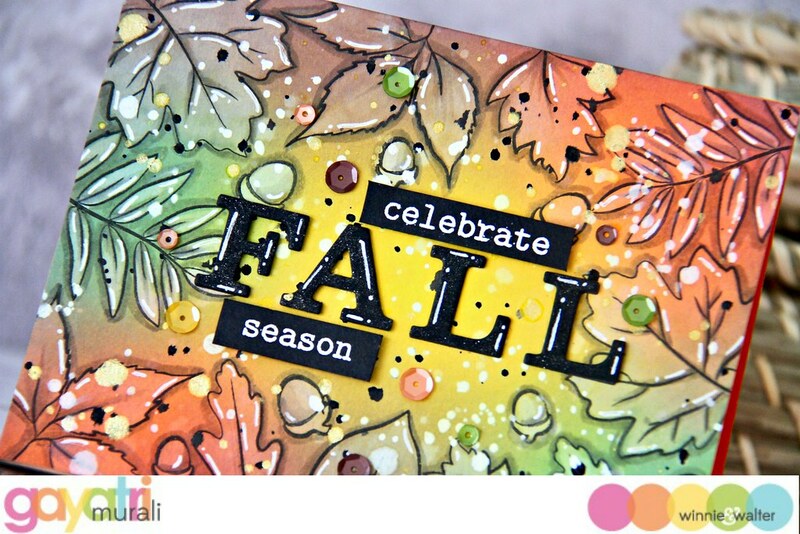 The die cut “FALL” sentiment is from Typecast: Cary Cutaway. I die cut the word “FALL” three times, stacked and glued the alphabet for dimension. Then I brushed it with clear shimmer and added highlights using white get pen. 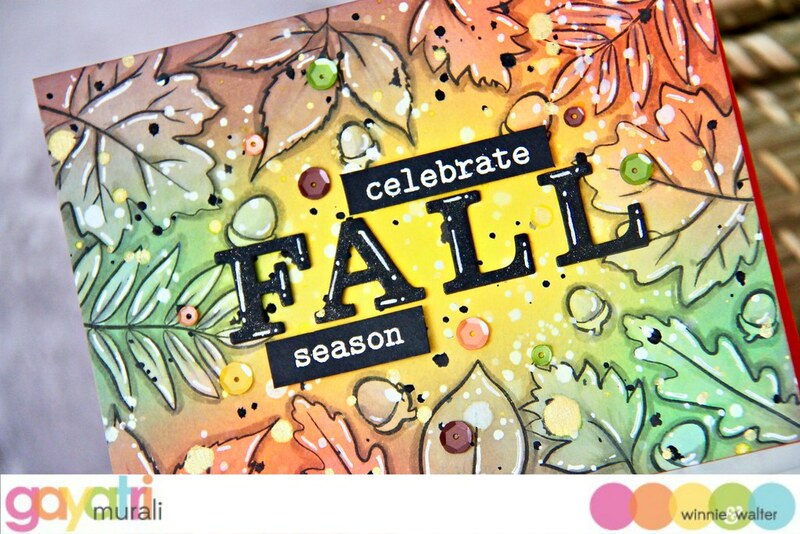 The secondary white heat embossed sentiments are from The Big,the Bold and Seasons stamp set. 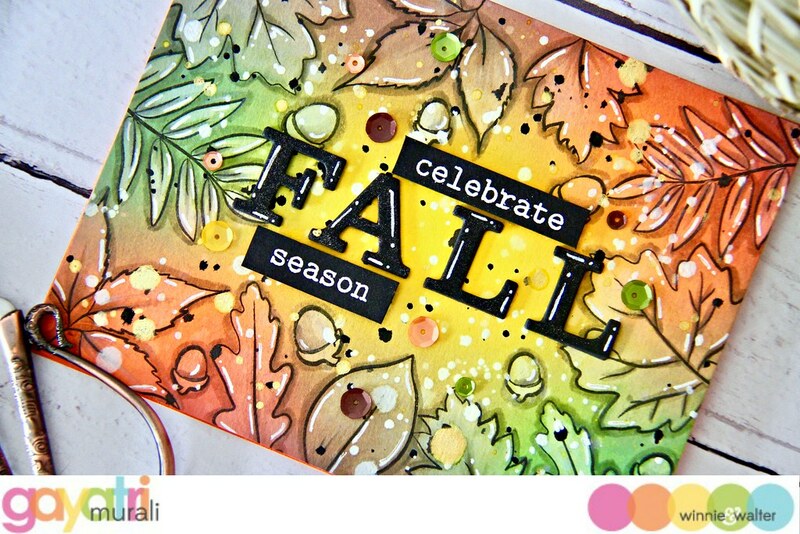 The strips of the secondary sentiment is adhered above and below the “FALL” die cut sentiment using foam adhesive. Finally a few sequins in the same colours as the background to finish the panel. I glued the panel to the card base using liquid glue. All the supplies used to make this card are listed below. Hope you liked my card for today and got inspired. Thanks so much for stopping by. Until next post, have a lovely week. Oooh, this is so beautiful! Love the colors!